The UNILINER has been designed to work in conjunction with irrigation controllers of any type for the purpose of improving the deployment ability and increasing the radius of operation of the controller. The UNILINER connects to the input/ output terminals of the controller and serves as a bridge to remote valves and sensors that may be located far beyond the range originally covered by the controller. Utilizing efficient radio or cable operated infrastructure The UNILINER offers a reliable and energy saving solution when remote accessories need to be controlled. The UNILINER is attached to the I/O terminals of the irrigation controller in place of the solenoids, water meters, fertilizer injectors or any other controlled accessory. The open/ close commands initiated by the controller are transmitted to the remote valves, and signals originated at the remote sensors are brought back to the controller’s inputs. Using a 2 wired cable with a cross section of 1.5 mm2 a distance of 10km can be reached. Alternatively, radio operated RTUs offer a cable free connection to remote accessories. The radio system does not need any licensing because of the frequency used and the low transmission power. Under good conditions, in an open field with no obstacles, a distance of 3km can be reached. The distance can be doubled by making some RTUs act as repeaters. The RTUs installed in the vicinity of the remote valves and sensors, are of a modular structure- 2,4,6,8 outputs and 4 or 8 inputs (8 inputs exist only when using the 2 wired system). In one case the RTUs are connected through the 2 wired cables, receiving both the energy and the communication through the same 2 wires. In the second case the RTUs are equipped with radio receivers/ transmitters and they are powered locally by dry batteries or rechargeable batteries with solar panels. It is important to notice that the radio RTUs are communicating bidirectionally, receiving commands from the centre and returning the sensors status back to the centre. 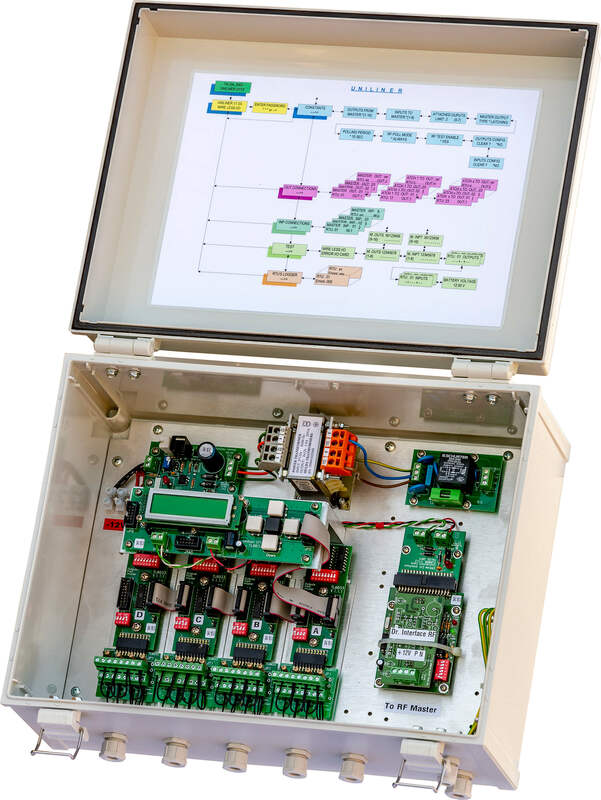 Up to 32 outputs can wirelessly send to 2 wire or radio RTU’s. In return, up to 16 inputs can be delivered back to the controller. The UniLiner software enables grouping of valves together to be irrigated in the same shift. The controller activates a single output but really the whole group will open. Up to 60 RTU’s can be connected through the 2 wire or radio channels. The UniLiner is equipped with a control panel for making definitions and for testing the systems operation. The UniLiner detects and reports malfunctioning RTU’s. The UniLiner is a DC system that can be fully powered by solar energy.